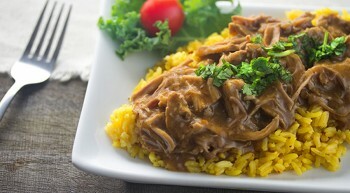 Vanee Brown Gravy is a rich, savory, full-flavored brown gravy, and stands ready to enhance any protein on the plate. Great for mashed potatoes, beef roasts, pot pie, meatloaf, poutine, and open face chicken, beef or turkey dinners. 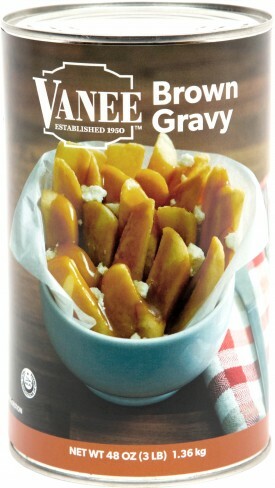 Vanee Brown Gravy has a convenient pack size, is shelf-table for easy storage, is vegetarian, has no added MSG, no high fructose corn syrup, is certified halal, has unparalleled batch-to-batch consistency, and cuts down on kitchen waste and labor. Each 48 oz. can yields 21 quarter-cup servings, for a total of 252 servings per case. Pour over meatloaf, cooked beef, chicken, potatoes, rice or noodles. Water, Food Starch - Modified, Enriched Wheat Flour (Wheat Flour, Niacin, Reduced Iron, Thiamine Mononitrate, Riboflavin, Folic Acid). CONTAINS LESS THAN 2% OF THE FOLLOWING: Soybean Oil, Salt, Sugar, Hydrolyzed Yeast Protein, Flavor [Hydrolyzed Soy, Corn and Wheat Protein, Yeast Extract, Dextrose, Maltodextrin, Corn Syrup Solids, Flavoring (Contains Canola Oil), Lactic Acid,Thiamine Hydrochloride, Calcium Lactate], Lecithin, Onion Powder, Caramel Color, Disodium Inosinate, Disodium Guanylate, Natural Flavoring and Coloring, Garlic Powder.